For your Banyuwangi tour package, you must be more familiar with a tour to Ijen Crater or to Plengkung Beach. However, you should know that there are actually some wonderful cultural attractions that Banyuwangi offers every year. One of the cultural attractions that you shouldn’t miss is the festival of Gandrung Sewu. What kind of festival is it actually? 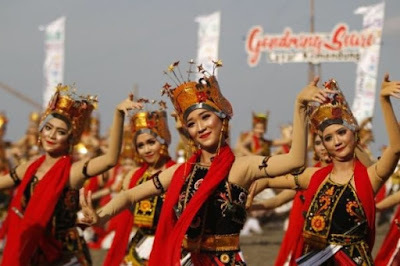 Gandrung Sewu is actually a festival where Gandrung Dance is performed by so many dancers. Gandrung Dance itself is a custom performance that has a long history. This festival is not always offered on Banyuwangi tour package because it is only performed once in a year in Banyuwangi. So, if this year event has been conducted, you need to wait for another year. According to the history, the Gandrung Dance is performed as a form of admiration toward Dewi Sri (Goddess Sri) who makes the society wealthy. This tradition is usually held as a form of gratitude after harvest season. Nowadays, Gandrung Dance becomes the icon of Banyuwangi and makes it as something you shouldn’t miss within your Banyuwangi tour package. What makes Gandrung Sewu is more attractive for tourists to watch nowadays is because this dance is performed by more than a thousand of dancers. They perform the dance on the beach that creates far more interesting sight. More interestingly, it is now also packaged with other art performances that can make your Banyuwangi tour package even more appealing. Since Gandrung Sewu is not only the one that you must watch during your tour in Banyuwangi, you can arrange a tour to another beautiful destinations and places too. Actually, you don’t need to be worry since Banyuwangi has numerous attractions that can create an unforgettable experience. Here are some of the best things to enjoy on your Banyuwangi tour package. If you consider staying for a longer time in the town, you shouldn’t forget to visit Plambangan Museum. Here, you will be able to see a few exhibits on local culture including local batik. There are several things of interest that you can see and it will be a nice thing to be included to your Banyuwangi tour package as well. There is another place that you can visit if you are around Banyuwangi town. Dedicated to Chen Fu Zen, this temple is actually a dragon-encrusted temple which is built in 1784. If you don’t want to get away too far from the downtown, this temple is well worth a peek. It can be a little treat to make your Banyuwangi tour package more exceptional! Those are a few things that you can enjoy after witnessing the wonderful Gandrung Sewu Festival. For your tour partner, we recommend you to work with Jogjabromotour.com to organize your fun tour in Banyuwangi. Simply browse www.jogjabromotour.com to discover the best Banyuwangi tour package you are interested in and contact them immediately for the detail!